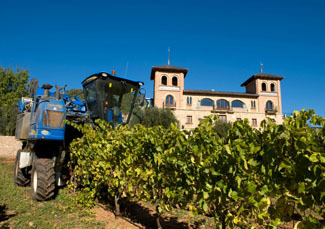 Whilst supported by traditional values, at Castillo de Monjardín we also make full use of innovation and the new technologies to ensure that our vineyards produce nothing but high quality grapes. The vines are wire-trained to limit the threat of disease. The spurs are pruned following the Cordon de Royat system. We sacrifice quantity for quality. The mechanised grape harvesting allows us to choose the best time for the harvest and to minimise the grape collection and transport times. Furthermore, the Chardonnay grape is harvested at night, at a temperature of between 7 to 9 ºC, to prevent any microbiological activity. We are pioneers in this process, the world over.